Do you run a charter bus service? It is important that you have reliable bus transportation for your clients. Here at Middleton & Meads, we understand how challenging the process can be to replace an aging fleet of charter buses. To help you stay in business and save money, we offer Bus repair services for transit buses, school buses, shuttle buses and tour buses. Never again will you have to worry about when your fleet’s preventative maintenance will occur. We will create a schedule for bus inspections and make sure you stick to it. When you run a dependable bus service, you add a touch of class that inspires potential clients to close the deal with your charter bus company. Private bus transportation is a competitive industry, it’s important that you keep your bus fleet in the best condition possible to maintain an elite advantage. With quality bus transportation and excellent customer service, clients will do business with you year after year. They will also increase the referrals coming into your business. Middleton & Meads is a world-class transit bus repair service company. From general bus care to refurbishment services, we do it all. Come to us for Major Collision and body repair services. Call on us for bus towing services. Maintaining an up-to-date fleet is the best way for your charter bus company to become reputable for safe, reliable bus transportation. And much more bus solutions. Keeping up with good truck maintenance is important for truck safety as well as business profit. Automotive repairs can keep your freight maintained for short and long hauls. Middleton & Meads understands that a truck breakdown can happen any day, any hour. You don’t want to get stranded. Middleton & Meads is well prepared to handle your automotive repairs. With multiple trucks, it is important to have a reliable automotive repairs shop at hand for your company. Middleton & Meads as a reliable automotive repairs shop will always ensure your business has high quality repairs. Our automotive repairs are quick and set repairs at a fair price so your trucks can get back to trucking in no time. Middleton & Meads is known for its excellent automotive repairs. 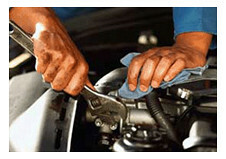 Our auto mechanics are highly skilled and provide excellent customer service. The auto mechanics at Middleton & Meads always maintenance their own tools to provide you the best replacement parts, warranties and more. You can’t experience that type of maintenance convenience anywhere else. Brakes, clutches, air dryers, starters, alternators and air conditioning work are just a few of the mechanical repairs performed at our shop. Complete in house collision repairs of all makes and models of trucks and trailers. Middleton and Meads is a Dupont certified shop. Has your bus been in a collision? If yes, it is important to have bus collision repairs completed as soon as possible. This article will discuss the importance of immediate bus collision repair services and where you can go for the best services. When you need bus collision repairs, it is important that you hire bus repair specialist for collision repair services. Why? A bus repair specialist will assure that all the right parts are quickly installed for quality bus repairs at an affordable price and in a timely fashion. And more bus repairs and fleet solutions. And more Bus Collision Repair Services. Contact Middleton and Meads by calling 410-752-5588 or click here today for information on bus repairs and bus maintenance. Preventive Maintenance for Trucks and Truck Tractors is an important component of life safety. This article will provide you information on how to complete preventive maintenance for a truck exhaust system. A truck exhaust system originates under the hood of your truck but most of its components are located under the frame such as the exhaust pipe, muffler, and tailpipe. The truck exhaust system can become severely damaged fro road elements of water, mud, slush, salt and gravel. These elements will eventually rust and corrode your exhaust system because the exhaust system is made from steel. Inspect the muffler for any holes and make sure the clamps and hangers are not rusting because they could break while you’re driving or it could make the truck exhaust system drag against the pavement. Inspect the heat shield. The heat shield should have no dent/dings to keep repair costs as low as possible. Make sure all components of the exhaust system are at least 1½ inches from the fuel system, brake system and any other potential unprotected combustible material. Inspect universal joints to assure there are no loose or missing bolts. Stay safe on the road with Middleton & Meads mechanical repairs and diagnostic equipment services and preventive maintenance solutions. A Maryland trucking company, Gunthers Transport, LLC, was forced to close last year after it was issued an “imminent hazard out-of-service order” by the U.S. Department of Transportation’s Federal Motor Carrier Safety Administration (FMCSA). This was after a FMCSA safety review of the company’s operations found several hours-of-service and vehicle maintenance violations. It was determined that these violations substantially increased the likelihood of serious injury or death to the motoring public. Gunthers Transport allowed its drivers to falsify their hours-of-service records and exceed the 11-hour limit for daily driving. Gunthers Transport did not require its drivers to perform pre-trip vehicle safety inspections. A copy of the imminent hazard out-of-service order can be viewed at http://www.fmcsa.dot.gov/documents/about/news/2011/GUNTHERS-TRANSPORTS-LLC.pdf. “FMCSA has zero tolerance for unsafe trucking companies that place the traveling public at risk. If they do not play by the safety rules of the road, we will take away their ability to operate,” said FMCSA Administrator Anne S. Ferro. Don’t let the same thing happen to your company! Trust your fleet’s maintenance to Middleton & Meads. Monitoring a fleet can be a difficult task, while you are running your business. That’s why Middleton & Meads offers a state of the art Fleet Management System to help maintain your fleet. Allow Middleton & Meads to customize a plan to minimize costly breakdowns. From cost reports to scheduling notifications, the Middleton & Meads Fleet Management System can help track your vehicle’s maintenance history as well as the costs to maintain your fleet. A well-managed fleet with well-maintained vehicles is sure to help boost the fuel economy of your trucks! Middleton & Meads: We keep your Vehicle on the Road and you in Business! If you have any questions about Fleet Management, please contact Middleton and Meads by calling 410-752-5588or click here today! Just as truck maintenance is crucial before the frigid winter weather sets in, so too is it crucial before the scorching summer weather takes affect. The typical hot, dry, and humid summer weather here in Maryland causes additional stresses on your truck. This makes spring (NOW!) the perfect time to address truck maintenance. Cooling System Issues: An estimated 40 percent of downtime is caused by cooling system problems, problems that are 100% preventable. 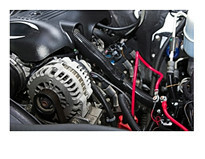 So be sure to perform routine engine maintenance to ensure that your truck is running as efficiently as possible. Engine Coolant: Your engine coolant should be checked every 500 operating hours, 20,000 miles or three months, whichever comes first. It is important to not only monitor coolant levels, but also color. Coolant that appears cloudy or has particulates floating could be an indication of bigger problems. Tire Pressure: The most critical factor in tire maintenance is proper inflation. Proper inflation leads to proper contact with the road, which will improve traction and braking capabilities. It will also ensure your tires last longer. Electrical Systems: Be sure to check the alternator’s wiring, battery, battery cables, and the wiring from the engine’s electrical controls. Make sure everything is in proper working order, wires are not frayed and there are no signs of corrosion. Middleton & Meads: The Middleton & Meads Corporate Headquarters is located at 1900 South Hanover Street in Baltimore. The over four-acre site contains the 35,000 square foot 37 service bay Mechanical Repair building, and the 15,000 square foot 16 bay Collision Repair Center, along with three acres of secure vehicle storage. If you have any questions about Truck Maintenance, please contact Middleton and Meads by calling 410-752-5588or click here today! Middleton & Meads prides itself on being at the forefront of the vehicle repair technology wave. As vehicles become more reliant on technology to maximize their efficiency, Middleton & Meads has embraced technology as a way to maximize the success of repairs. This is why Middleton & Meads features the Hunter Alignment Systems in our Baltimore and Beltsville shops. The Hunter Alignment Systems can diagnose problems with a vehicle’s caster, camber, and toe so that the correct adjustments can be made to the vehicle. Hunter Alignment Systems significantly reduce service time. Having a correctly adjusted alignment can help improve fuel economy and life expectancy of a vehicle’s tires. Hunter Alignment Systems significantly reduce the distance required from the front turnplates to the front bay wall to secure accurate alignment readings. The Hunter Alignment System provides detailed documentation of alignment issues and their adjustments. The Hunter Alignment Systems use a minimum amount of bay space. If you have any questions about the Hunter Alignment Systems, please contact Middleton and Meads by calling 410-752-5588 or click here today!